When René Descartes (1596-1650) first proposed his Cartesian or analytic geometry, I doubt that he could have foreseen what a revolution it would generate in mathematics. You need to read about this French mathematician and philosopher who has influenced our modern world so much. To give you some idea of the ways in which he dramatically changed the face of mathematics you need to realise that it was he who invented the convention of representing unknowns in equations by x, y, and z, and knowns by a, b, and c (using both ends of the alphabet). If you have ever wondered why we use x so often in our algebra, now you know! He also introduced the idea of using superscripts of our normal Hindu-Arabic numerals as powers (or exponents). So, you now know who was responsible for your index notation, such as a³. He was a pioneer and champion of algebra as a method to represent, aid and automate reasoning (especially about abstract quantities). Previous mathematicians had adopted the Greek view that geometry and number provided the foundations for all mathematics. Because of this disposition, they regarded algebra using powers higher than three as not representing anything in the real world (which is three-dimensional). Along with the German mathematician and polymath Gottfried Leibniz (1646-1716), however, Descartes envisaged a more universal mathematics which would mechanise general reasoning … in other words, they envisaged a language that would express pure thought. Their efforts resulted in (among other things) the development of symbolic logic which has profoundly influenced the development of electronic circuitry and computers. To return to our topic … one way in which Descartes achieved this goal was to realise that, by creating axes at right-angles to each other (to represent the variables x and y, for example) he could create picures/images of the algebra that he was studying. In other words, he turned the traditional emphasis of mathematics upside down and used algebra to describe geometry. We have here the beginnings of coordinate geometry. Prior to Descartes’ invention of analytic geometry, there were no graphs as we know them! So, thank Descartes that you can now see your algebra in the form of pictures/graphs. It was largely thanks to Descartes’ influence on algebra and analytic geometry that Isaac Newton (1642-1726/7) and Gottfried Leibniz (1646-1716) were able to invent calculus. Many years elapsed before mathematicians used the term graph in the way that we use it today. Not much more than 100 years ago, the Scottish mathematician George Chrystal (1851-1911) was the first person to write about the graph of a function (in Algebra, 1886, page 307). It was even later, in 1898 that the Irish engineer and mathematician, John Perry (1850–1920), appears to have been the first person (in print) to use graphing as a verb … on page 21 of his Applied Mechanics (1898). 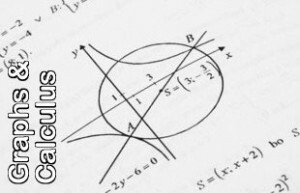 He wrote, Students will do well to graph on squared paper some curves like the following. I hope you realise what a legacy has been left to you, and how recently some of it has been provided. The way that we speak of graphing something is little more than a century old. There are so many things that we can graph, but that story is partly contained in the pages listed below!